The Team adheres to four simple rules. Through daily practice of these rules and a commitment to the scientific process, the team will be greater than the sum of its parts. Aaron was born and raised in the major metropolis of Schenectady, NY, located somewhere between Manhattan and Buffalo. Venturing westward, he received a B.S. degree in chemistry in 2012 from the University of Nevada, Reno where he completed research on the controlled synthesis of 2D polymers in the laboratory of Prof. Benjamin T. King. The smell of BBQ and warm weather lured Aaron to the University of Texas at Austin where he received a Ph.D. in 2016 under the mentorship of Prof. Christopher Bielawski. His graduate studies focused on the design and synthesis of photochromic N-heterocyclic carbenes and unlocking new, externally switchable chemical reactivity. Trading brisket for pork shoulder, Aaron recently joined the Leibfarth group at UNC and is excited to begin exploring new polymerization methods to enable access to functional materials. Elango was born and raised in Tamil Nadu, a southern state in India. After his master’s degree, he worked in a pharmaceutical company for few years learning the tricks of the trade in process chemistry. Tired of hot and humid climate, he moved to Fargo, North Dakota State University in 2010 to experience the extreme cold and pursue his doctoral studies. His graduate studies focused on controlling the stereochemistry of atropisomeric compounds during phototransformations. After graduation, he moved to Columbia University for a postdoctoral research position in the Campos group where he developed singlet fission materials for next generation photovoltaics. Feeling nostalgic, he moved to UNC to enjoy weather more similar to his home country and develop novel fluoropolymers for water purification and battery applications. Raised among flocks of sheep in the back country of New Zealand, Marcus was instilled with a love for the natural environment at a very early age. However, due to his deeply ingrained rebellious subconscious, or perhaps laziness, Marcus has been observed occasionally throwing plastic bottles in the trash and improperly disposing of used batteries. Those who knew Marcus circa 2014 knew of the guilt and demons he struggled with. Not until working under the tutelage of Dr. Stephen Miller at University of Florida did Marcus realize his environmental sins could be absolved through a whole-hearted and feverish pursuit of green polymer chemistry. After graduating from UF (2016) with a B.S in chemistry and a minor in sustainability studies, Marcus moved to UNC where he currently works on using/developing continuous flow chemistry in the hope that others, like himself, may be more efficient and effective in pursuing green polymer research, which will one day lead us all to environmental salvation. Finding few reasons to leave his beautiful hometown, Travis Varner attended the College of Charleston in Charleston, South Carolina. Although he spent his fair share of time on the beach (and in the bars), Travis managed to graduate with a B.S. in Biochemistry in 2016. Following a short hiatus as a rap artist (with hits like “Rotorap” and “Dry Ice Ice Baby”), Travis decided that the life of fame and money was not for him—so, he went to graduate school. He was delighted to join the Leibfarth group at UNC, where his research focuses on polymerization catalysis. When not working in lab, Travis enjoys cooking, memes, being outside, and grappling with deep ethical dilemmas. Jill hails from the quiet town of Ruckersville, Virginia, nestled in the countryside of the Blue Ridge Mountains. Since she prefers the beach to the mountains, Jill wanted to go eastward for her college education and attended The College of William & Mary. While there, she dabbled in soccer, chemistry, and parties. Upon obtaining her B.S. in Chemistry in 2016, Jill followed her Carolina-blue heart to Chapel Hill, NC. During the entire pursuit of her Ph.D., it is likely that Jill will continue to claim she is an organic chemist despite making REALLY big molecules that most people call polymers. Nick was born in Jacksonville, Florida, but quickly moved to the suburbia of Pennington, NJ, in the search to find better football teams. Despite NJ having better drivers, upfront attitudes, and distinct seasons, Nick chose to attend the College of Charleston in Charleston, SC. After four years of pure, unrelenting humidity, Nick graduated with a B.S. in Biochemistry in 2017. He couldn't imagine a life without his former college roommate, Travis Varner, so he followed him to UNC and joined the Leibfarth lab shortly thereafter. Despite having an undergraduate research background exclusively in biochemistry (not polymers), Nick perseveres. His current project focuses on synthesizing fluorinated polymers for in-vivo studies. In his free time, Nick enjoys cooking milk steak, magnets, and It's Always Sunny in Philadelphia references. Rob Johnson was born in Greensborough NC and raised in Wilmington. Not straying too far from home, Rob attended North Carolina State University where he graduated in 2017 with a B.S. in Chemistry and Chemical Engineering. Brushing aside the rivalry between the two universities, Rob decided to pursue a Ph.D. in Chemistry at UNC and joined the Leibfarth group. His current project involves post polymerization modification through photoredox catalysis. Like all those from Wilmington, Rob enjoys long walks on the beach and candlelight dinners. Irene grew up surrounded by golf courses in Pinehurst, NC just down the road from Chapel Hill. Attempting to escape both winter, and her Tar Heel upbringing, she moved to sunny Miami, FL for her undergraduate studies, where she did research in bioorganic chemistry in the lab of Dr. James Wilson at the University of Miami. 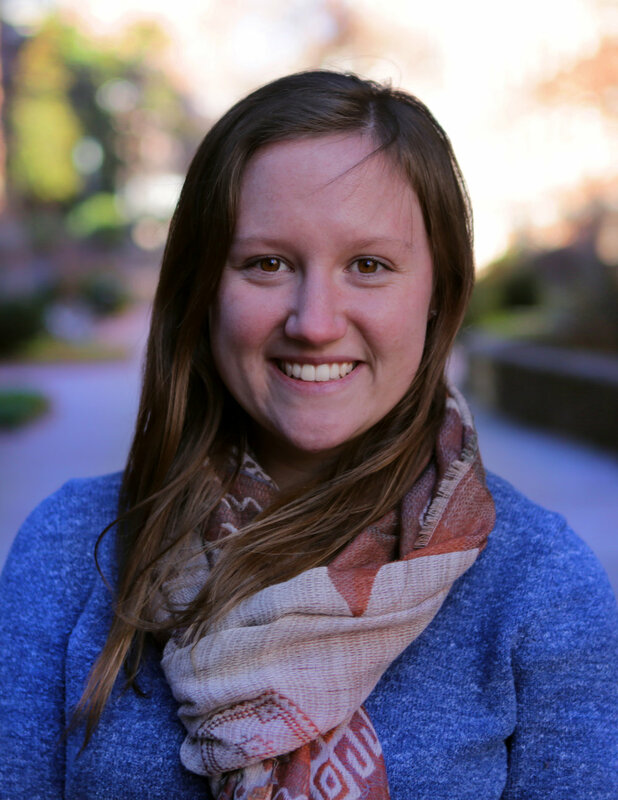 Despite the lack of Cuban coffee in North Carolina, after graduating in 2018, Irene was excited to return to the Land of the Pines to pursue a PhD in chemistry in the Leibfarth group. When she’s not studying post-polymerization modification, Irene can usually be spotted bundled up in orange and green and drinking a hot beverage any time the temperature drops below 85 degrees. Shefali was born and raised in Raleigh, NC and now attends UNC as a sophomore undergraduate chemistry major. Her interest in flow chemistry and sustainability drew her to join the Leibfarth Group in the spring of 2018. When she isn't conducting experiments in lab, Shefali enjoys experimenting with new recipes in the kitchen and cheering on the Tar Heels! Bradley was raised in Raleigh, NC and now attends college just down the road at UNC. A biochemistry major interested in working with flow chemistry, he joined the Leibfarth group in the spring of 2017. Bradley is currently working on the fluorination of polymers using flow chemistry. When not working in the lab or in class, he enjoys playing on the club lacrosse team and supporting Carolina athletics—GO HEELS! Roscoe is Frank's long-time companion and provides overall group support. Roscoe also does many calculations while in Frank's office. Although Roscoe has yet to share his arduous work with the group, he is convinced it will be of the highest impact. Roscoe loves when everyone comes over to his house so he can convince people to provide him with both affection and snacks! Wednesday is Marcus’s sweet and sassy pet bunny. She loves snuggling and strawberries. However, she is best known for her really big brain. She offers the group her bountiful knowledge of carrots and leafy greens. Wednesday would love to collaborate with Roscoe but he is intimidated by her intellectual prowess and he might mistake her for a snack!